Shield Drone Services Have Got a New Toy! Being unable to film from a drone, during the wind and the rain, is a problem no more!!! Being unable to film from a drone, during the wind and the rain, is a problem no more!!! Shield Drone Services have found the solution! 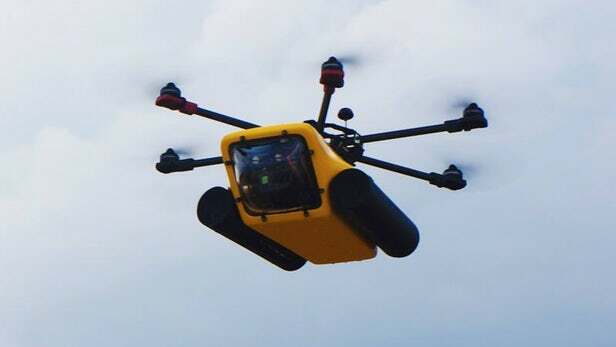 The HEX H20 is a multirotor fully waterproof drone capable of landing, filming and taking off from the water. Sitting at surface level with a 90’ camera tilt the drone is capable of taking images and video straight down under the water up to horizon level, then taking off continuing to film offering seamless video. The HEX H20, is fully equipped using a stabilised gimbal mounted camera, meaning we can capture 4K video and up to 12MP images. Post edit enables us to offer the video in super wide format or standard format adding to the capabilities of the drone. The drone is also equipped with a quick release system, carrying payloads up to 2Kg then releasing them wherever you desire. Made from epoxy composite and equipped with DJI E600 motors and 14” props, the HEX H20 truly is a durable, capable workhorse, capable of filming almost anywhere in almost any conditions! In addition to the above, their HEX H2O, has a large hull and extendable legs, allowing additional equipment to be fitted to the underside i.e. Lighting to be able to see even further in darker conditions on the water. Believed to be the first of its kind in the South West, this durable drone is more than capable of taking the video/images you have always desired, but have been unable to capture due to the fragility of its predecessors. Check out their demo video, for a brief example of what can be achieved.